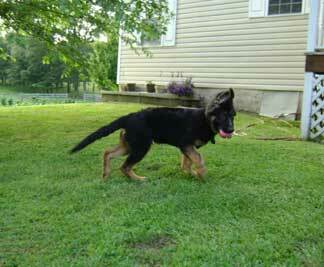 I would like to submit a photo of my 18 week, plush coat, bicolor GSD puppy to you. We call him Kaiser or Kai registered "Kai Kal'El ben Mikha'el". He is from working lines and has such a sound temperament. He has a high prey drive. In this picture we are playing ball. He is the most intelligent dog I have ever owned and wonderful with our toddler also very concerned every time our newborn cries. His mother was 80 pounds and his father was 110 so we believe he will be large. His coloring keeps turning darker red and his black seems to be spreading instead of fading. It's starting to go down his front legs and on his toes! He's incredibly receptive and sharp and he always retrieves, there's never a time when he won't it seems! When my husband and I are out with him together he will give us turns to throw for him by bringing my husband the ball after I throw and me the ball after he throws it. lol It's really funny. I guess he picked up on it because we would give each other turns. He doesn't always do this every day but it is adorable when he does! He will begin personal/family protection training at 18 months with our local service dogs of america group. Thanks for letting me submit my photo!